The story of Emirates whose success is intertwined with the rapid development of Dubai could be nothing but fascinating. Against a backdrop of regional unrest and volatile global economies, progress has been maintained at a rapid pace in every year of Emirates’ and Dnata’s existence. The following is a timeline of the airline’s history. Emirates tops up A380 orderbook of 58 by placing 32 more to 90. The airline places order for 30 Boeing 777s, worth $9.1 billion at the Farnborough Airshow in July. Emirates begins flying the Airbus A380 on the Sydney, Auckland, Bangkok, Toronto and Seoul routes. Emirates becomes the world’s largest operator of the Boeing 777 with the delivery of the 78th plane. The company moves into the new multimillion dollar Emirates Group headquarters. Emirates’ dedicated Terminal 3 opens in October and within a month 500,000 passengers pass through it. Emirates signs contracts for 120 Airbus A350s, 11 A380s and 12 Boeing 777-330ERs, worth an estimated $34.9 billion (Dh128.16 billion), at the Dubai Air Show. Emirates signs an agreement for 10 Boeing 747-8F freighters in a deal worth $3.3 billion. Emirates Group workforce totals 25,000 people from 124 countries, making it Dubai’s biggest employer. 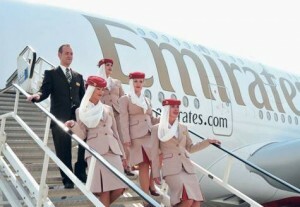 Emirates makes its first flight to North America – a non-stop 14-hour flight to New York’s JFK Airport. This marked the first non-stop passenger service from the Middle East to North America. CAE and Emirates join forces to open the $100 million Emirates-CAE flight simulator. Emirates places $19.1 billion worth of orders for 71 aircraft. Emirates expands service on Dubai-Sydney route with the first A340-500 joining the fleet. In a survey of 2.7 million airline passengers by Skytrax Research, Emirates is voted Airline of the Year. The Shaikh Rashid Terminal opens, increasing the capacity at Dubai International Airport to 22 million passengers a year. in the new Terminal 3 with a capacity of 20 million passengers a year. The first of 17 new-generation Airbus A330-200s arrive in Dubai. Passenger traffic through Dubai International Airport hits 11 million. Emirates is voted Best Airline in the World at the prestigious OAG Awards. Airline defies high fuel prices to again post record profits as passenger figures top three million and cargo hits 150,000 tonnes. Airline takes delivery of its first Boeing 777-200 and becomes the first airline to show take-offs and landings live. Its maiden flight to London is followed by Emirates’ inaugural flight to Melbourne. As the airline celebrates its tenth birthday, it has a fleet flying to 34 locations in the Middle East, Far East and Europe. Emirates is the first airline to equip an Airbus fleet with an inflight fax facility. Emirates becomes the first airline to introduce telecommunications on an Airbus in all three classes. A $2 million terminal exclusive to Emirates is opened at Dubai International. Damascus is added to the Emirates route network, giving it 12 destinations in just 38 months of business. Deals are struck to fly to London’s Gatwick Airport as well as Istanbul, Frankfurt and Male, the capital of the Maldives. On July 3, A6-EKA flies from Toulouse to Dubai as Emirates takes delivery of its first bought aircraft. Maurice Flanagan embarks on ambitious mission to launch an airline with $10 million in five months. Shaikh Ahmad and future president Tim Clark join Flanagan’s team. Deals are struck to fly to Karachi, New Delhi and Mumbai. A PR disaster is thwarted by recruiting 80 Emirates staff to travel incognito to disguise the dismal sales of tickets on the maiden flight. His Highness Shaikh Mohammad Bin Rashid Al Maktoum and Flanagan discuss launching an airline in Dubai. Maurice Flanagan is among a 10-man team that produces a business plan for the new airline – to be named either Dubai Airlines or Emirates airline. Shaikh Rashid Bin Saeed Al Maktoum opens the airport and implements innovative open-skies policy.